Corporate customers and public institutions may pay by invoice after a credit check has been carried out. When using this payment method, your order is delivered together with an invoice. We expect your payment within 3 working days on our account. To ensure a smooth transaction, please respect this time frame. Advance payment can be made either via online banking, through your bank or post office. The payment information is displayed during the order and you will also receive electronically (e-mail) all the informations. Generally, articles are reserved for you immediately after your order has been completed. 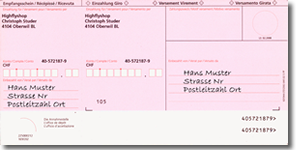 Once we have received your invoice amount to our postal account, we will send the goods to you as soon as possible. Depending on the stock situation, it may happen that some items will be restocked until a later date. Deposit slips are not dispatched by post. Our detailed account information will be sent electronically via email to you. The fee charged is 3% of the total amount. Paypal is an international payment service allowing transactions to be made directly between vendors and buyers. Paypal processes your payment before forwarding it to us. You only need your PostFinance Card and have all the information available for the payment, you only need the ID number on the back of the card and the card number on the PostFinance Card Front side (under the magnetic code). The fee charged is CHF3% of the total amount. This payment method allows you to make payments in our online shop via e-banking and your PostFinance “yellownet” account. Your order will be sent immediately after we receive payment. 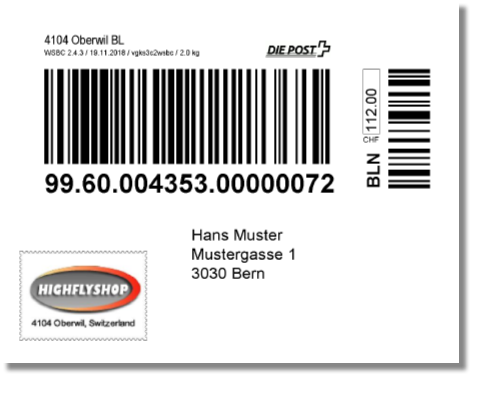 When an order is given by cash on delivery, the goods can be sent immediately and will be paid directly to the postman or at the post office only upon receipt. The fee charged is CHF 15.00.